Top off a fantastic day in San Diego with this sunset cruise. 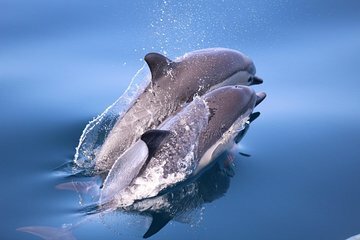 This excursion takes you from Mission Bay out to where dolphins and whales are known to swim to give you the opportunity to see them in their natural California habitat. Sunset is the perfect backdrop for learning about the whales and dolphins that call the San Diego waters home. What started out with only good expectations because of the time of year turned into mild disappointment as we saw no whales and only a few dolphin, and those from a distance (their backs as they crested the water, too, so no jumping or swimming next to the boat). The sunset, however, was rather spectacular. A good time was had by all, tho, as this was a very nice experience. Be warned, tho — it got windy and choppy and more than one person lost their lunch. Still, I took over 170 photos. Because we saw no whales, we all received 50% off our next cruise! First experience out on the Pacific and the crew was very friendly and very knowledgeable. I enjoyed the cruise and will go again on my next visit. We had an amazing time on the sunset cruise. The staff was very friendly, polite and knowledgeable. We were even fortunate enough to see several friendly and playful dolphins.